COB (Chip-on-board) is the new generation of LED lighting. Several LED chips are bundled to a big lighting module. Thus the work lamp obtains a 5-times bigger illuminated area as common LED lighting. This high performance work lamp is handy, sturdy, extra light and 2 times bright. You always have the perfect light source in your hand. 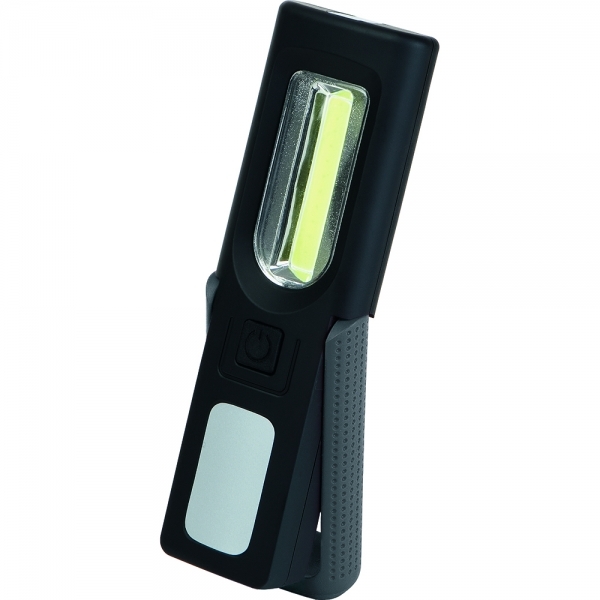 The torch with its 1 LED (50 Lumen) provides a light for various occasions. The highlight of this 2-in-1 lamp is the work lamp with extremely bright COB LED (140 Lumen). Ideal to use for repair work, handicraft, camping, in case of car breakdown or in your leisure time. The strong magnet, which is integrated in the bracket and 2 point magnets on the rear side of the case, can be used for fixing the lamp on ferrous metal surfaces. The foldable bracket allows to adjust the lamp up to 90° up or down and light up your working area perfectly. Thanks to its useful belt clip you always have the torch at hand. It can be positioned optimally by the integrated, 360° turnable fold-out hook on the back side of the lamp. The slim case with its soft touch coating lies conveniently in the hand. Lighting duration: flashlight up to 10 hours, work lamp up to 3 hours. 3 AAA batteries included. We recommend Doming for your ad. In prices included!